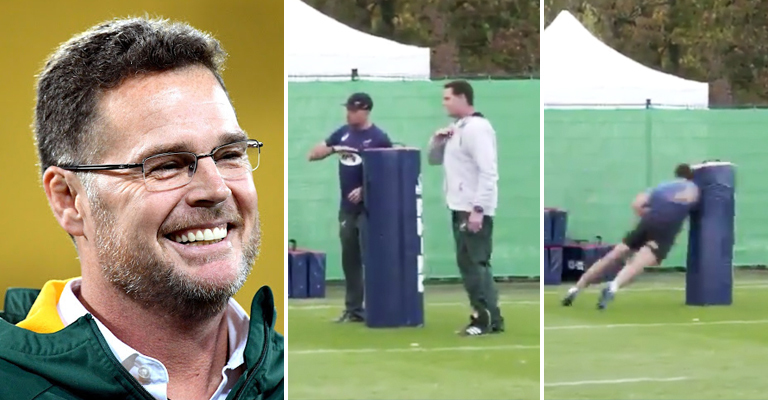 Springbok head coach Rassie Erasmus is a man of his word it words it seems, after he was spotted trolling World Rugby this week in training following Owen Farrell’s controversial tackle on André Esterhuizen over the weekend. Farrell somehow escaped any sanction for a thumping tackle on Esterhuizen in the final moments that many felt was completely illegal. Most agree a penalty at the very minimum should have been awarded to the Boks, giving them a chance at winning the game with the last kick. And now he’s been spotted in training, teaching Esterhuizen how to tackle like Farrell! Troll level: 1000.